The heating is still not on, although we did light a fire last night just to cosify ourselves. 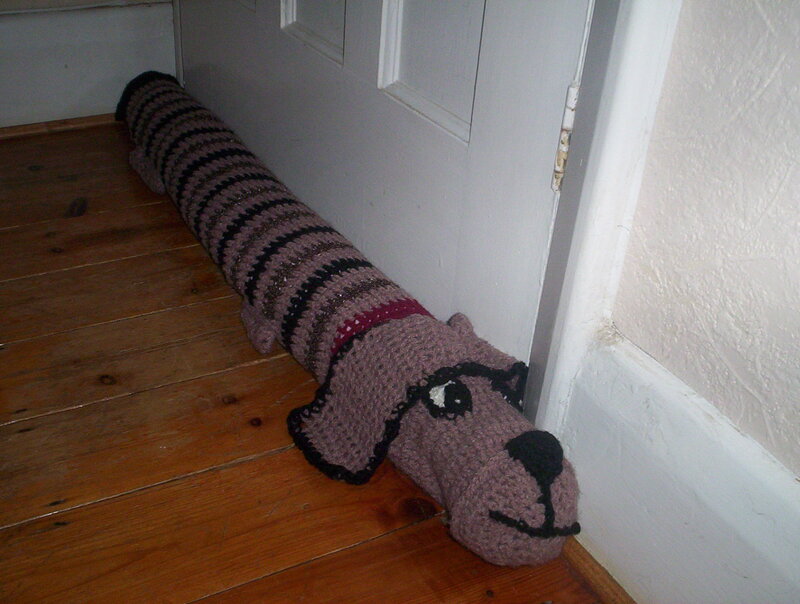 I have finally finished the sausage doggy draught excluder and we had a ceremonial plonking of him in the appropriate place, ie: the huge gap at the base of our very ill-fitting living room door. We stood back, Himself and I, surveying my handiwork. I’m actually quite pleased with it: made of yarn from my stash, left over from projects of years gone by, stuffed with an old fleece picnic blanket that is too threadbare to lay on the ground, but just right in size and shape when rolled up, to be the draught-proof sausage! It cost nothing but the time, and let’s face it, all the time I’m having to rest, I’m able to spare a bit of it! Crochet doggy draught excluder reporting for duty! HIMSELF: What did you use? MYSELF: Bits and bobs, you know … left overs, it didn’t cost anything! MYSELF: You know, from other things, it’s from the wool left over. HIMSELF: Is that my jumper? HIMSELF: You know, the wool from the jumper you knitted me .. the big warm one. MYSELF: Hmm, the brown of his face, um, yes, see what you mean … yes, I think there was some left over. HIMSELF: So now I match the draught excluder …? You can see how the conversation went, clearly he is less than impressed by the fact that his clothing matches the soft furnishings of the home, despite the fact that both are keeping him warm and cosy (and actively contributing to the lack of heating bill)! Sigh!